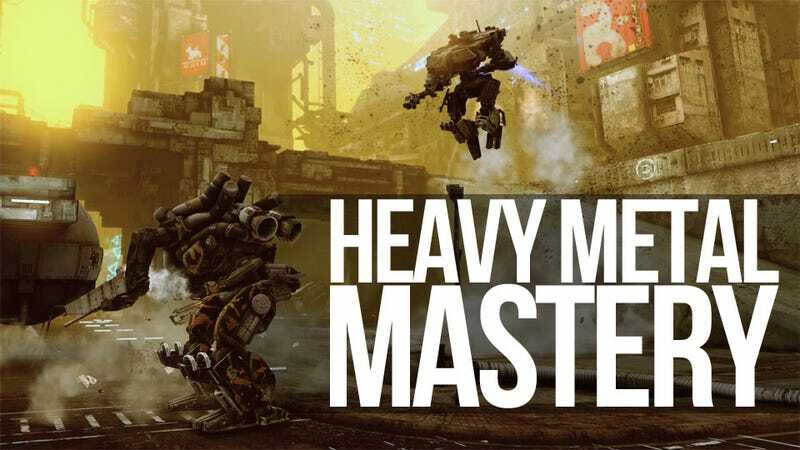 For more than a year now Adhesive Games' indie PC mech shooter Hawken has tantalized us with breathtakingly gorgeous scenes of giant robot carnage amidst dystopian cityscapes that combine anime sensibilities with Moebius-level intricacy and detail. The aesthetic has won us over time and time again, but what of the gameplay? My most anticipated appointment of E3 2012 was my invitation to play Hawken during a special event held last night at the Luxe hotel in downtown Los Angeles. It's also the appointment that had me the most anxious. This would be it. I was finally getting to play a game that I'd been salivating over since the first footage arrived in March of 2011. Each new asset from this free-to-play mech game raised my expectations to new heights. That's dangerous when you're dealing with a small team of unproven developers. My unease followed me up the stairs in the lobby of the Luxe, past the registration line and through the hallway to a room where a couple dozen PC monitors flashed scenes of mechanized mayhem. Its grip grew tighter as I took my seat, turned on my voice recorder to take notes, slipped on a headset, and fiddled around with mech customization options prior to my first match. If you were to listen to that voice recording now, you'd hear five minutes or so of me getting familiarized with the controls, aided by one of the developers. You'd hear my voice raise as I noted key points I wanted to address or remember. You'd hear nervous laughter as I took my first lumbering steps. And then you'd hear nothing else for fifteen minutes except for breathing, clicking, and the occasional under-the-breath "yes!" As stunning as the visuals are they were not the main attraction here, though I must say that those trailers we've all seen are nothing compared to the game running in 60 frames-per-second on a crystal-clear computer monitor. In the rare quiet moments between spawning and engaging the enemy I found myself pausing to admire the view, soaking in the atmosphere before the distant sounds of thundering ordnance drew my attention. The simplicity of constructing my custom mech threw me at first, being used to the more robust options and staggering depth of games like Armored Core. You pick a light, medium or heavy frame (the heavies were absent in the demo), choose your weapons and fiddle about with a modest selection of parts. Colors and patterns can be tweaked to an extent, but not so much that it spoils the splendor of the games' visuals with garish splashes of color. It's not a deep system, sure, but I don't really want to spend 30 minutes getting everything just right before launching into a match that lasts all of 10. Hawken's mech customization is more akin to a load-out screen from a modern first-person shooter, designed for easy-in, easy-out access, something I truly appreciated once I started playing. Slipping into the pilot seat of my heavy metal war machine I was presented with intuitive, easy-to-master controls that soon had me trading shots with the best opponents the five-on-five deathmatch had to offer. Basic WASD movement is supplemented by space bar-powered booting and a shift key-driven slides. The 'R' key deploys special items, such as grenades and bubble shields, and the 'C' key powers down your mech for repairs, something to do only if you're sure the enemy isn't lurking right around the corner. And you can never ben sure the enemy isn't lurking around the corner. The left mouse button fires your primary weapon; the right your secondary, and that's it. One of Hawken's most appealing features is this economy of control, something Adhesive Games has managed to pull off without sacrificing the feeling of mechanical titans battling on a massive scale. The screen rattles and shakes as enemies collide, each footstep shaking the screen ever so slightly. It's a powerful experience, and one I couldn't afford to appreciate for too long; a medium sniper mech only has so much health. Good thing it maneuvers like a champ. Hawken's most remarkable feature is the balance that is struck between size and mobility. The team at Adhesive has found the sweet spot between the slow, lumbering mechs found in older simulation titles and the speedy-yet-detached arcade experience of games like Virtual On. This is the perfect combination of speed and strength, power and grace. And I am good at it. Of the three rounds I played I managed to stay in the upper levels of the team rankings each time. That's not bragging; it's shock that I might have found the game that an aging gamer, tired of spawning into a first-person shooter and taking one step before being shot dead immediately, can excel at. I attribute this to the fact that while there have been plenty of passable mech experiences over the past few years, it's been ages since we've had one that's truly been great. The more mature gamer remembers the greatness of the genre, and is ready to reclaim that greatness. Younger gamers are welcome to play as well, of course, but don't get too cocky or we'll have to put you down. The Hawken gameplay experience doesn't live up to the expectations set by months of teaser trailers and expertly composed screenshots; it exceeds them. This is the multiplayer mech combat game I've always wanted, a perfectly balanced experience that collects the best aspects of the genre in one complete package. Find out for yourself on Dec. 12, when Adhesive Games sets Hawken free.